2) To make the glaze, combine teriyaki sauce and Maple Orange Garlic Sauce in a sauce pan on medium heat until simmer (slightly thickens). Let it cool set aside. 3) In a small pan, melt butter and add ginger. Cook until crisp and golden brown. Set aside. 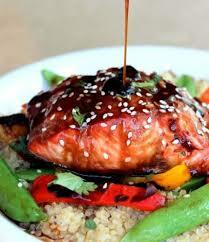 4) Season the salmon with salt, pepper and a drizzle of olive oil. Spread the glaze on the flesh side until covered. 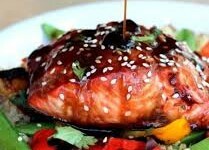 5) Place salmon in the oven and bake until cooked thoroughly. 6) Let it cool, and top it with fried ginger and sesame seed. Directions for Teriyaki Sauce: Combine ingredients in a saucepan on medium heat until the sugar is dissolved. Optional: Serve or side with rice.